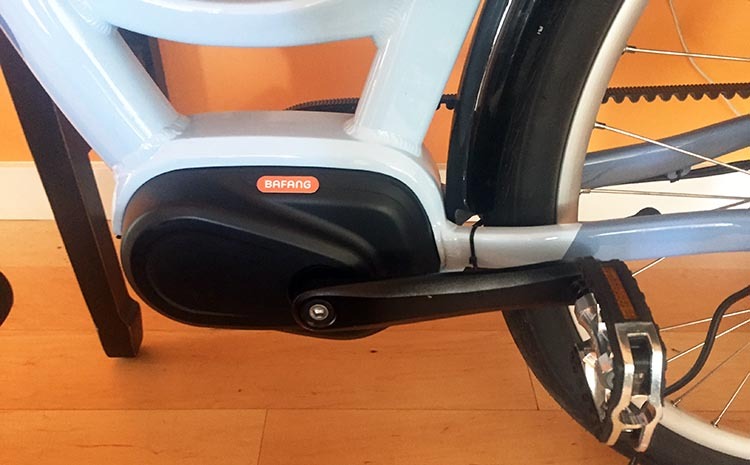 We had fun recently assembling the Evelo Galaxy ST e-bike. It arrived in a flat box, in several carefully wrapped pieces, and turned out to be quite easy to assemble. Maggie did most of the assembling, while I took some photos. 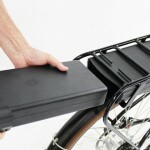 The end product was a stunningly lovely electric bicycle – that just happens to be superbly fully loaded too. The Evelo Galaxy ST is really a beautiful bike. Everyone who sees it just stops and says “Wow.” And it’s fully loaded too! Want to find out more? Read our full review here. You can also read more about this premium electric bike here. At first sight it looked like a lot of pieces, but as we sorted through them, we realized it was all pretty straight forward. Probably the trickiest part was putting on the front fender. We realized afterwards that we should have slid it into position before we put the wheel on. If we had done that, it would have been really easy. Hindsight is always 50/50! 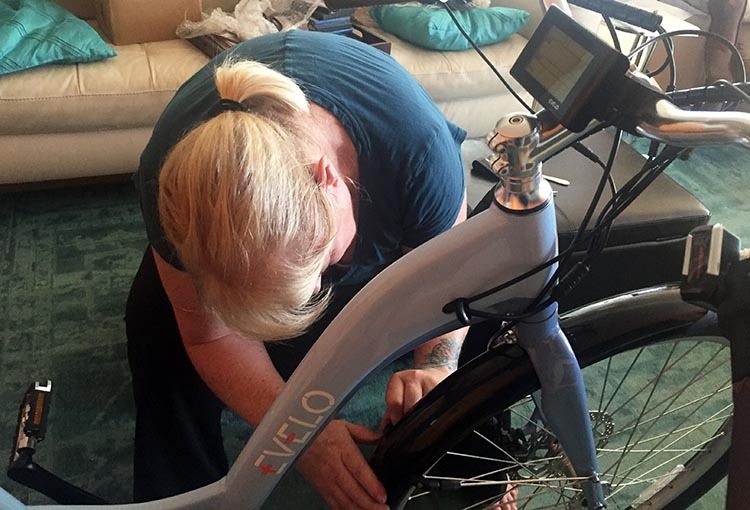 With the help of the instruction manual, Maggie had the whole bike assembled and ready for charging in about ten minutes. Here is the finished product, which is now standing in our living room. 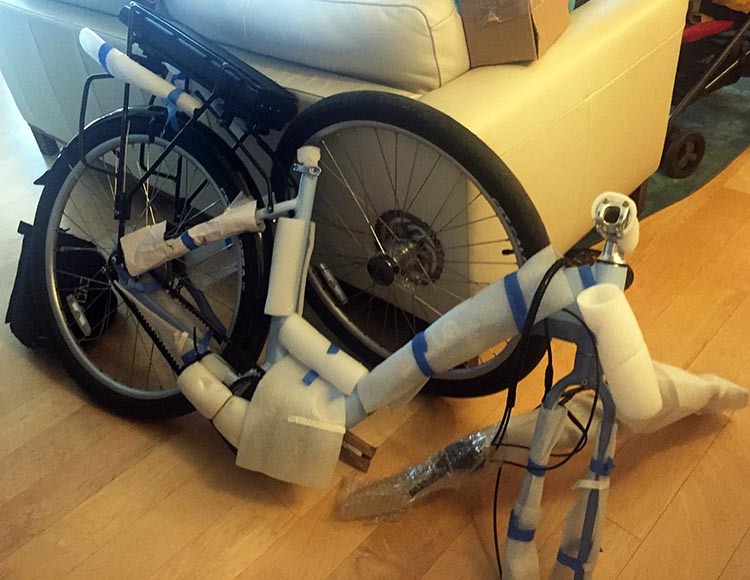 We were really pleased to see the transformation from a few foam-wrapped pieces into this beautiful e-bike. All of our guests admire it. 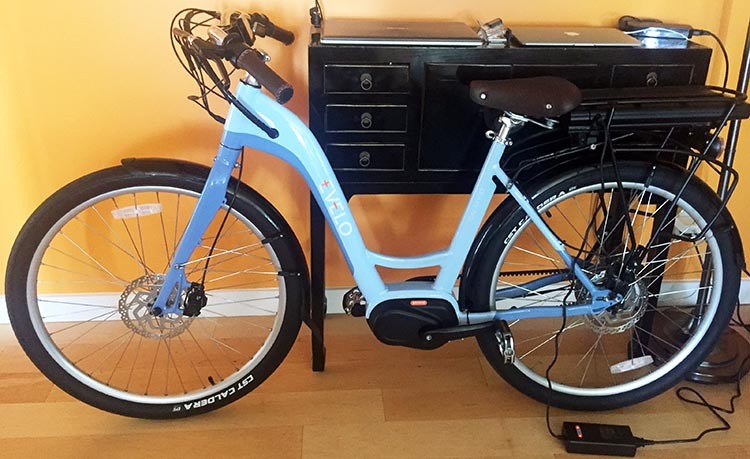 If you are ever stuck for talking points with guests, try having an electric bike in your living room! Next comes test riding the Evelo Galaxy XT e-bike. Once I have done that, I will be publishing an in-depth review, so watch this space! I am expecting great things from this bike. 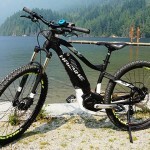 I have reviewed a lot of e-bikes so far, and I seldom see the high-end features, attention to detail, style, and creativity that are immediately obvious on this bike. This e-bike is a hybrid between a classic cruiser and a comfort bike. Its upright riding position is sure to offer a comfortable ride, while the step-through frame will make it easy to get on and off. The Gates belt drive that replaces the chain. 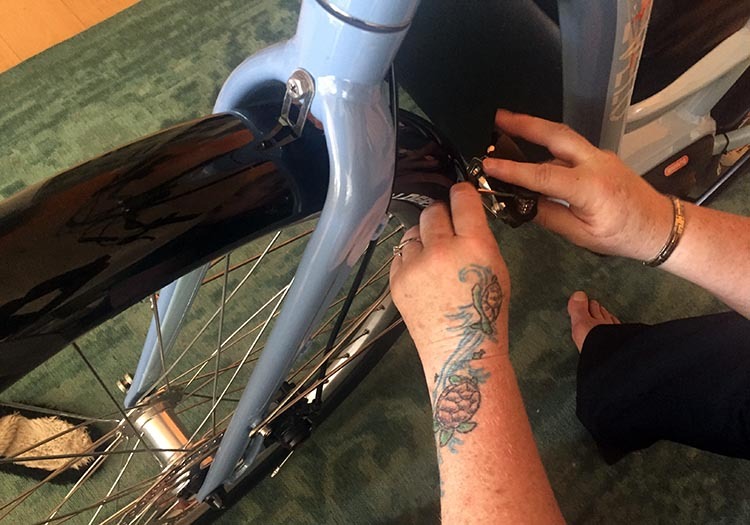 Belt drives require no maintenance, are not greasy, and do not rust. 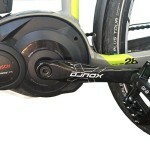 Mechanical disk brakes for power braking. Stylish handlebars with faux leather comfort grips. A comfy, stylish saddle with springs. All of the cables are tucked inside the frame, offering a streamlined appearance with minimal maintenance. The best place for cables is out of sight, out of mind, in my opinion. That way they cannot rust, and do not snag on things. It also makes for a more streamlined looking bike. 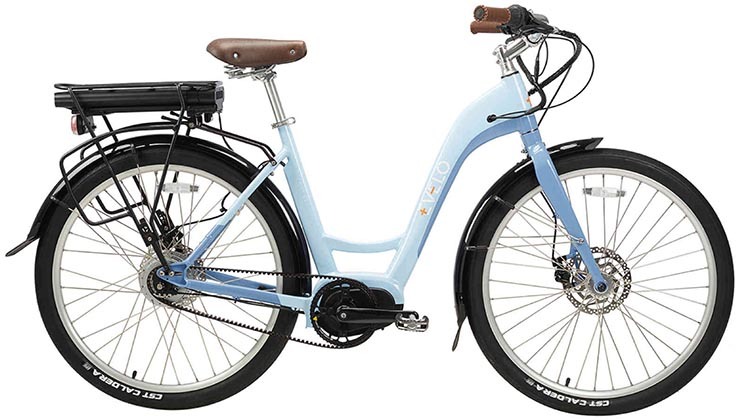 Evelo has a whole range of premium electric bikes, and offers 0% financing options to make it easier to get onto one of these beautiful bikes. Plus, I notice that they are offering Black Friday deals, so this would be a great time to go check Evelo out! 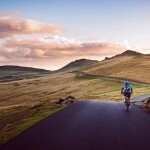 Thinking of buying an Electric Bike? Check out my new 2018 edition of How to Buy the Best Electric Bike! Buy it here. 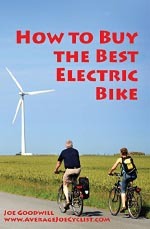 Read all about How to Buy the Best Electric Bike here. Please consider clicking through to one of our reputable affiliates for your online shopping needs. We are proudly affiliated with Amazon, which sells pretty much everything except puppies - and has outstanding, free return policies. 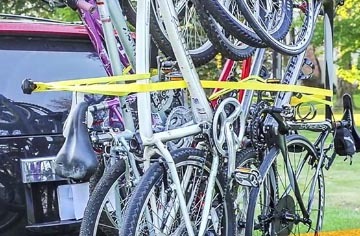 For your cycling and other athletic shopping needs, we are affiliated to Competitive Cyclist, Bike Wagon, Raleigh Bicycles, Jenson USA, REI Co-op, Backcountry, Commuter Bike Store, and Moosejaw. When you buy from our affiliates we make a small commission, and this is the only way we earn some income for the many hours of work we put into our reviews and posts. Plus, it costs you nothing at all - a real win/win situation! Want to read more? Check out our Start Here! page, which has handy links to our Categories and to our all-time Most Popular Posts.